I was not blessed with good weather during my stay in Singapore. It was warm – hot not to say – with temperatures in excess of 30°C most days. But it was rainy most of the time meaning that my usual excess of aimless wandering was somewhat restricted. However, I still managed a fair few stops at good quality coffee shops. As with Seoul, I found a pleasing number of different roastery cafes showcasing locally roasted coffee. 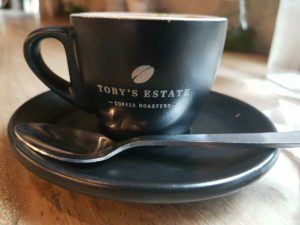 My first stop was at Toby’s Estate, near Robertson Quay. It served me a bright espresso as I sheltered from a fairly dramatic downpour. It’s a smart place and I enjoyed my brief stay. Next up was the excellent Common Man Coffee Roasters. Their espresso was the best I’d had for quite a few days with a lovely complexity with a good creamy finish. It was served with a little milk bottle of sparkling water which was quite cute. 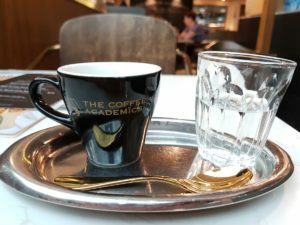 Next day, I stopped at The Providore near Raffles Place. It radiated cool but the coffee was a little flat and ordinary. It started the day with a power-packed shot but didn’t have much to please the palate. Hong Kong based The Coffee Academics was my next stop, downstairs in the Raffles City mall. They are an evangelical mob spreading the good word of speciality coffee wherever they go. The espresso I had was of good quality but just a little flat and lifeless, which was a shame. Oriole served me a very good chocolatey Brazilian shot to start another rainily humid day. It continued a short run I’d been on of only wanting food items on the menu that were unavailable or discontinued. I was 2/2 at Oriole meaning I had to seek breakfast elsewhere. For balance, I popped into one of the local chains called The Coffee Bean & Tea Leaf. I’d spotted a few branches around Seoul, too. It served me a very poor espresso. It was over-roasted and darkly bitter. It had little in the way of redeeming features. Things were redeemed at a really good cafe called The Populus, near to Outram Park underground station. Their espresso, which looked to be a house blend was excellent and served in some very stylish crockery. Nearby Just Want Coffee proclaimed its love for Jesus in the window but still managed to serve a devilishly good espresso. It seemed a suitable place to round out my Singapore coffee experiences. 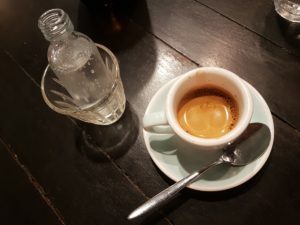 There was plenty of good coffee on offer in Singapore, but it felt slightly more dispersed and less saturated than a couple of the previous cities I’d visited. Some of the prestige places seemed a little style over substance, but there was good stuff to be found with Common Man the outstanding place I visited.